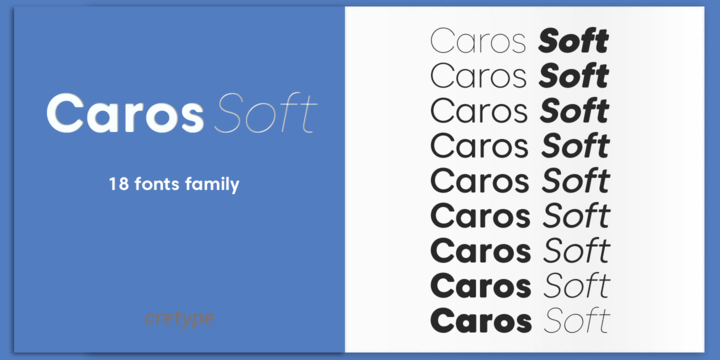 Caros Soft is a modern sans serif typeface created by Hyun-Seung Lee and published by cretype which is the rounded version of Caros. This geometric typeface contains 18 fonts, 9 weights (from Thin to Black) and their italics, a wide range on OpenType features and multilingual support. It is a simple, clean and readable font, suitable for any kind of project such as editorial use, packaging, headline, logotype, magazine and so on. Have fun! Price: starting from $20,00 for one font to $140,00 far all 18 fonts. A font description published on Tuesday, June 6th, 2017 in cretype, Fonts, Hyun-Seung-Lee by Alexandra that has 4,080 views.